The Eastern Scheldt Barrier is the largest and best known of the Delta Works. The 9 kilometre long structure seals off the Oosterschelde if there is a threat of flooding. The Eastern Scheldt Barrier connects the islands of Schouwen-Duiveland and Noord-Beveland in Zeeland and was built between 1976 and 1986. It is the largest storm surge barrier in the Netherlands. The Eastern Scheldt Barrier is a unique project. At the time, it was the largest ever structure to be built in terms of its scale and dimensions. And it is still unequaled. The barrier is regarded worldwide as a landmark in hydraulic engineering. has 65 colossal pillars, separated by sluice gates that are roughly 42 metres wide and 6 to 12 metres high, each weighing between 260 and 480 tonnes. Rijkswaterstaat has a special team to operate the barrier. The team is assisted with crucial information from the Hydro Meteo Centre, based on its predictions and measurements. We close the Eastern Scheldt Barrier if the water level is predicted to rise to more than 3 metres above Normal Amsterdam Level (NAP). It is closed from the ir. J.W. Topshuis on the artificial island of Neeltje Jans. At the press of a button, all 62 sluice gates are lowered and it takes 82 minutes for them all to close. If for some reason the barrier does not close, there is an automatic emergency closing system. To date, this system is never used. By constantly looking ahead, the Netherlands is the safest delta in the world today. Thirty years ago, Rijkswaterstaat built the Eastern Scheldt Barrier. It is the largest of our country's Delta Works: no less than 9 kilometres long. Protecting hundreds of thousands of people against high water. To keep it this way, the Eastern Scheldt Barrier is undergoing a major renovation. Together with expert partners we work on the safety, accessibility and quality of life in the Netherlands. Our country is a country of resilience. For centuries we have faced increasingly higher levels of water. And with each challenge we come out on top. By constantly looking ahead, we're the safest delta in the world. Thirty years ago, Rijkswaterstaat built the Oosterschelde storm surge barrier. Our country's largest Delta Works: no less than nine kilometres long. We did this for our own safety, and for that of future generations. An enormous task that took us about ten years to complete. Step by step, a solid foundation emerged beneath our feet. We showed real backbone, and our years of hard work produced an impressive result. 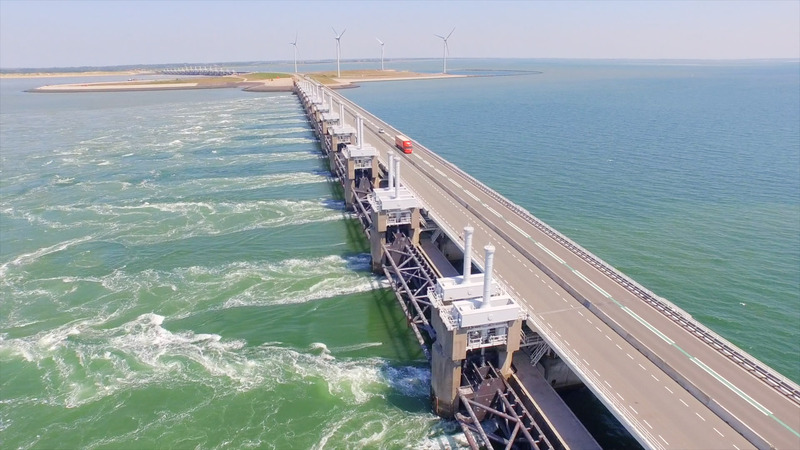 It may seem perfectly normal... the Oosterschelde storm surge barrier protecting hundreds of thousands of people against high water. But that it's possible with just a push of a button is simply amazing. To keep it this way, after 30 years of faithful operation the Oosterschelde storm surge barrier is undergoing a major renovation. We will wrap the gates and give them a new protective layer. Together with expert partners we work on the safety, accessibility and quality of life in the Netherlands. Together, we build the Netherlands.